Discounted Price: This book is NEW, however it has a tiny bit of scuffing on front and back cover. Description: Millions of Catholics travel to shrines to pray before her image. But what is not commonly known is that Muslims also hold her in high regard, and even among Hindus and Buddhists there is worship of goddesses that bear a striking resemblance to the Catholic Mary. 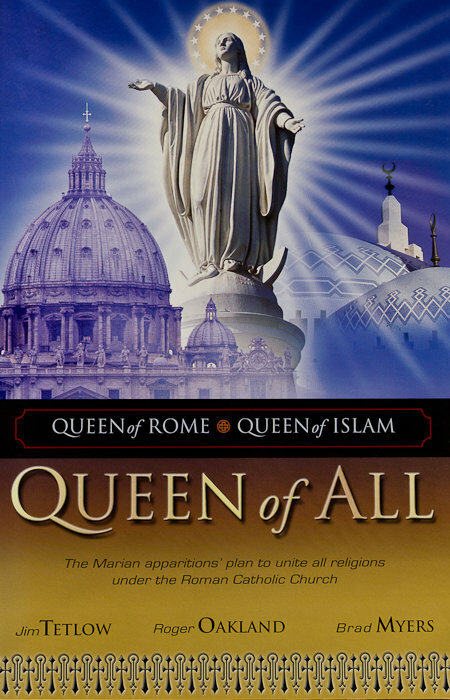 In this book, the authors show that Mary is not only Queen of Rome, but will be the unifying factor to bring all the great religions of the world into unity under Rome. She will be "Queen of All." Millions of Catholics travel to shrines to pray before her image. But what is not commonly known is that Muslims also hold her in high regard, and even among Hindus and Buddhists there is worship of goddesses that bear a striking resemblance to the Catholic Mary. In this book, the authors show that Mary is not only Queen of Rome, but will be the unifying factor to bring all the great religions of the world into unity under Rome. She will be "Queen of All."